The 28.9 metre sailing yacht Mariposa 3a, listed for sale by Matt Albert at Yachting Partners International, has been sold in an in-house deal. Delivered by the Dutch Vitters yard in 1994, then refitted in 2012, this sleek black-hulled sloop harks back to the great J Class yachts of yesteryear with her beautiful lines, classic sheer and deck house profile. Yet she marries vintage looks to a modern Dubois hull and keel design for an extremely slippery and seaworthy vessel capable of world-wide cruising in any weather. Decor below by Redman Whiteley Dixon is as elegant as her exterior. Finished in blonde teak and exquisitely curvy throughout, she accommodates six guests in three cabins, including an owner's suite in the stern with a large queen-size bed, shower room, bidet and vanity unit, desk and good stowage, plus a double cabin and a twin, both en suite. There are quarters for three crew forward. The 2012 refit added a new MAN 256hp engine, plus new decks and new sails. 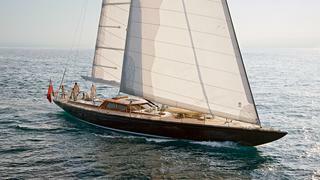 Mariposa 3a was asking €1,950,000 and has been renamed Grit.